Here’s a quick way to be a hit at parties. Get yourself a good quality cask and all the fittings, fill it with good quality ale and let people just help themselves. I was invited to a party the other week (to celebrate the harvesting of the garlic crop at a friends’ farm) and I thought it be a nice gesture to supply the beer – especially as they let us use their holiday home, and also we’re friends with a lot of the other guests. 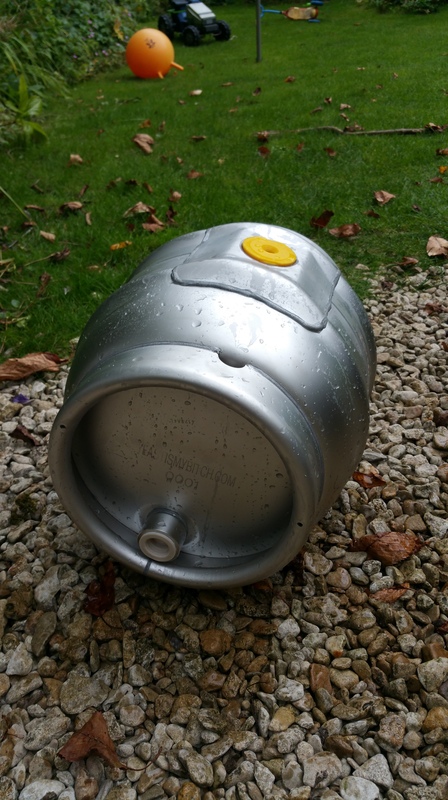 During a brief conversation, I mentioned that I would be writing an article on real cask ale at home and Ged said that they’d be happy to supply the cask at zero cost, if I was happy to do a review of it in the forthcoming article! Knowing that I’d need Shives, Keystones, Taps, Spiles, etc. (all of which we’ll get to in a bit) I also contacted some suppliers of cask sundries. Mike at Inn Cellar Equipment (http://www.inncellar.co.uk/) also came back almost immediately with an offer of all of these things for FREE too…if I gave them a mention and a link. Before we go into the detail of how to actually cask the beer, let’s take a while to examine the quality of this kit. First the cask: I’m glad that Kammac agreed to supply this cask to me, because if I’d had one from anywhere else I wouldn’t have been able to experience the quality. All of the weld seams are FAULTLESS (my Dad is a panel beater/car restorer so I know good welds when I see them!) the overall finish is excellent and it’s a solid and substantial (8.5Kg!) container. By comparison, Cornelius kegs seem flimsy. I reckon a a dedicated team of ham-fisted draymen trying their damndest couldn’t damage these Kammc casks in a month of Sundays. If I’m ever in the market for a fleet of casks – if I turn professional, for instance – Kammac is where I’ll be heading. It’s also worth mentioning that Kammac are a British company through and through, and that their 4.5 and 9 gallon casks are made to BFBI standards and finished in their state-of-the art UK production facility in Skelmersdale. Please don’t think I’m just saying this because they gave me a free one – I’m saying this because it’s all true. You know me, I don’t hold back when I think a product is sub-standard. Secondly, we must take a look at the cask sundries: Inn Cellar supplied me with free bits and pieces too: the shives and keystones are excellent quality and more than stood up to my blundering hammer-work when clouting them into place; likewise the tap took it’s hammering home with no problem and performed faultlessly – even while a succession of random people at the party wrenched and fiddled about with it to get at the beer! 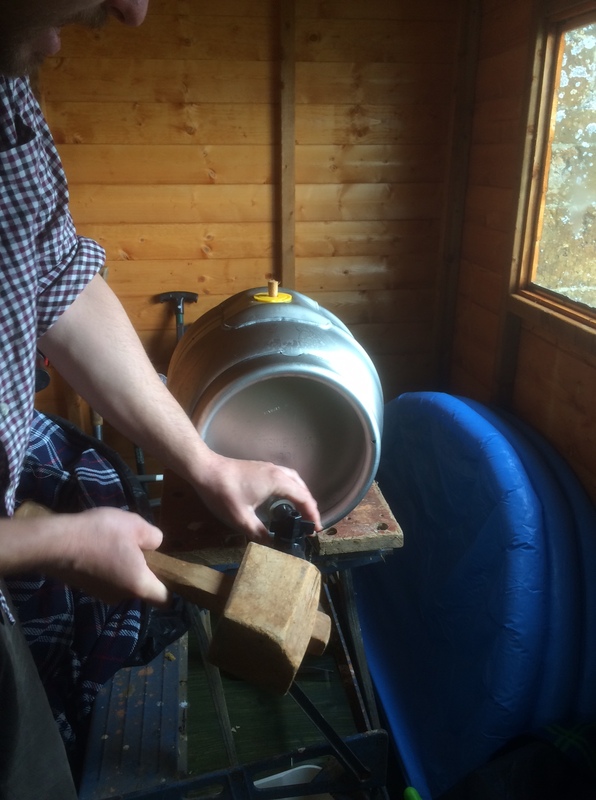 So how did I prepare a cask full of beer? Using a wooden mallet, or weighted rubber mallet. tap home the keystone into it’s respective hole on the front face of the cask – you do need to give it a little bit of welly, but it gets there eventually. Now sanitize the cask, I used Star San as I use it for just about everything else. About half-a-litre worked fine. 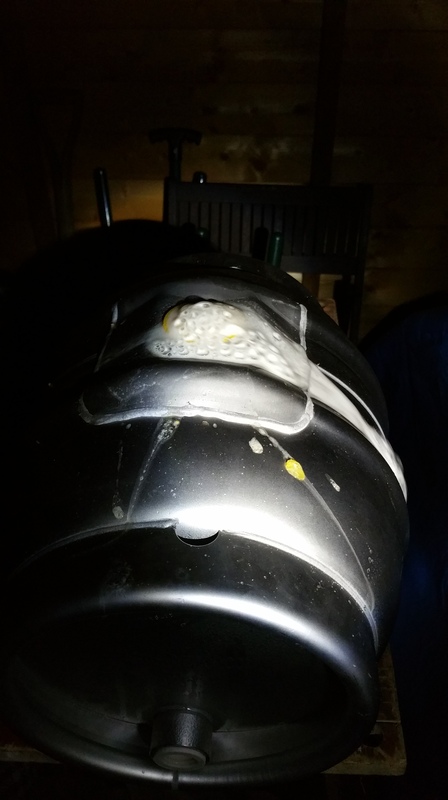 Just remember to keep your hand over the shive hole to stop it going everywhere, while you shake it into all the corners of the cask. After draining the cask of Star San, I stuffed 30g of dried whole-leaf Cascade hops through the shive hole and then covered the hole with tin foil. I put the priming solution in and then siphoned the bright beer on top. After that it was a simple matter of sterlizing the shive and tapping that into the shive hole with the wooden mallet. I let the cask sit at 19C for ten days to carbonate. 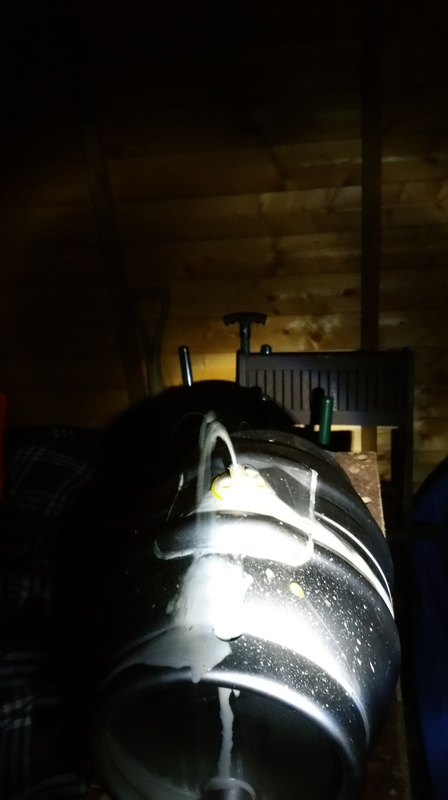 After ten days I gingerly picked the cask up and transported it to it’s final serving location, a sturdy bench in a coolish garden shed. Then we waited. Three days later we opted to tap the tut through the shive and put the soft peg in – this allowing the carbonation to steady and allowing us to tap it the day after. The next morning we tapped the beer by placing the tapered end of the serving tap against the face of the keystone and giving it a sizeable wallop with the wooden mallet to drive it home. 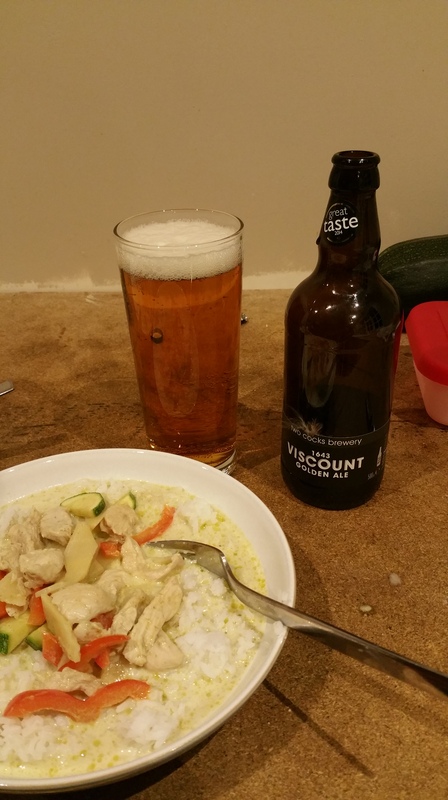 The beer tasted great – but last nights frenzied fobbing had raised a haze in the beer. Not a show-stopper, but a little disappointing – especially after so much work to produce and cask it. Nevertheless everyone who drunk it enjoyed it – and the cask was drained by the party’s end. 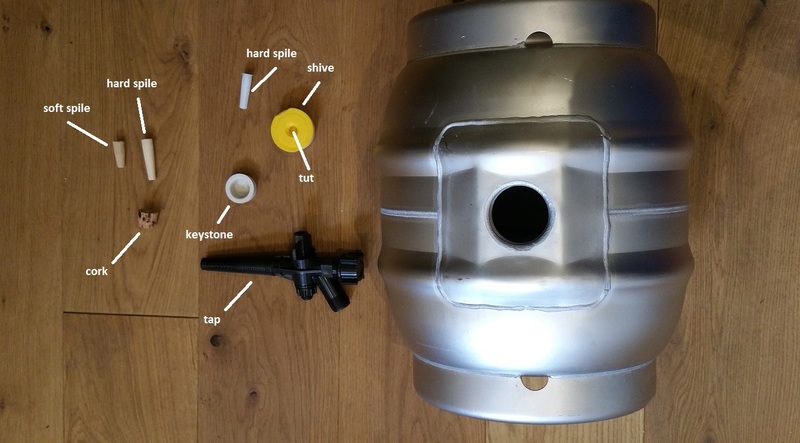 Big thanks to Ged at Kammac and Mike at Inn Cellar Equipment for making my cask ale dream a reality! There’s not a massive aroma to Viscount, but I’d know that Nelson Sauvin hop signature anywhere: it’s all elderflower, gooseberry and white summer berry fruits. The colour is light and coppery (much darker than other Nelson Sauvin beers I’ve had – Thornbridge Kipling being the most famous example. A thinnish white head caps off the appearance nicely. The taste is excellent, I mean first class: a light summery freshness which both refreshes and encourages further consumption; there’s gooseberries, lychees and a faint, but very enticing, root ginger note. A gentle sweetness rounds the whole thing off. This is a beer that could well give Kipling a run for it’s money in a blind taste-off. The nose is enormous and heavy with thick roastiness and a big old resinous hope edge. As with all roasty ‘n’ hoppy beers there’s a lovely old leather, bookish, theme about it with some yeasty fruit on the very back. Taste-wise we’re getting with enormous amounts of malt, I mean massively malty with a lovely soft effervescence. 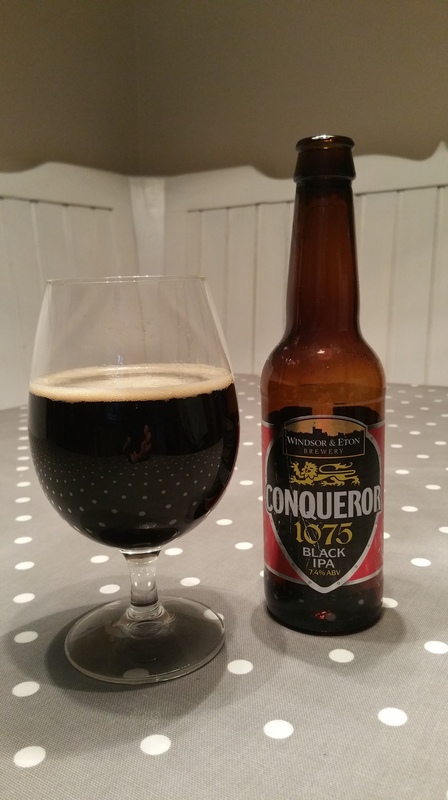 Huge great roast flavours mingle with those fat resinous hops – lending that same “deep leather armchairs at a Gentlemens’ club” theme that we first encountered in the aroma – but there’s also some liquorice and further roast, which enhances the overall complexity. At 7.4% (flip!) we do get a blimmin’ great alcoholic warmth, but there’s no offensive alcoholic burn. It’s all nicely fitted together…which is no mean feat; I know that beers this big are a difficult act to pull off and for that we must applaud the folks at Windsor and Eaton.